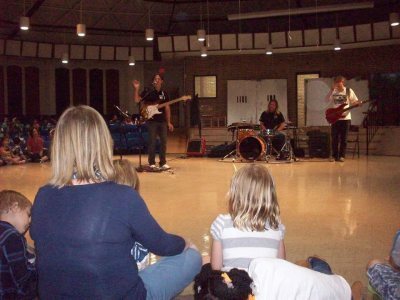 Crossroads Blues Society has participated in Blues In The Schools programs since May of 2002. Through the end of the 2017-2018 school year, 338 programs have been accomplished for over 68,000 students in the greater Rockford/Northern Illinois area. This past school year was our most successful yet with 95 programs for over 10,000 students. 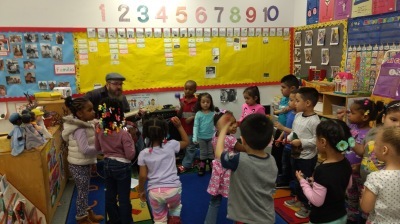 One of the highlights was our second attempt at Blues in the Pre-School with all of the Head Start centers. 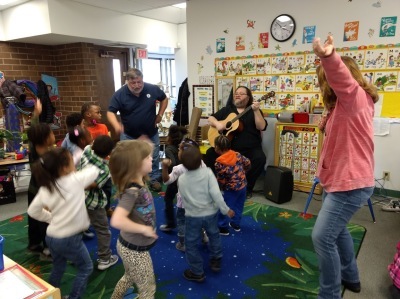 Wheatbread Johnson did 57 programs for over 1,500 preschoolers who loved to sing, play music and dance with us. Another highlight was adding Wheatbread to our BITS repertoire along with Ivy Ford, Donna Herula, Burddog and Beck and Ron Holm. 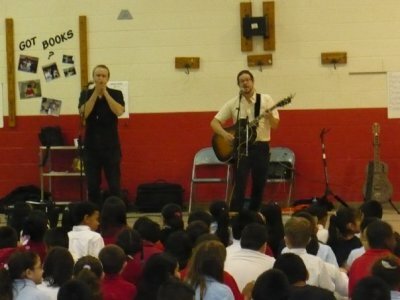 Dave Fields also came out twice from New York City for programs; see the video on the right with Dave Fields and his Band at Carlson Elementary School on Friday, December 16, 2016. BObby Messano also returned as did Gerry Hundt and Ronnie Shellist, Tas Cru and Mark Dvorak with David Causey. 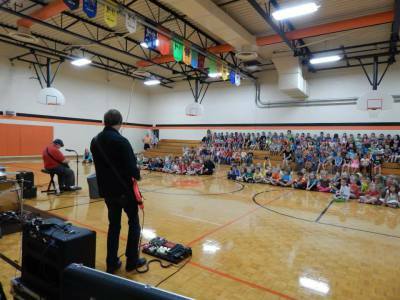 Below is also a video of an opportunity where Eastland Middle School students listened to and learned from an exceptional blues duo - Paul Rishell and Annie Raines - on Tuesday, November 1, 2011 which was professionally taped and edited. 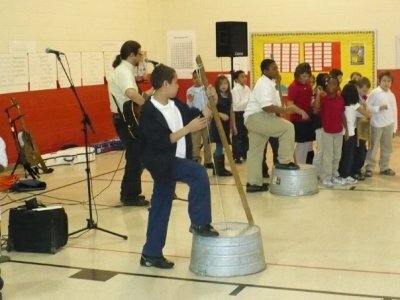 Blues In The Schools (BITS) is a nationally acclaimed cultural and musical appreciation program that helps students understand the rural and urban African-American culture. 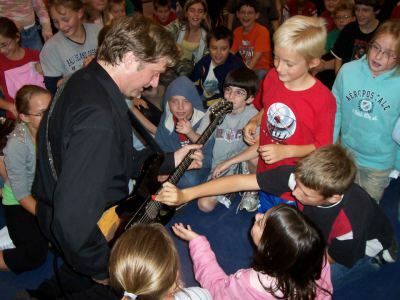 Age appropriate content is formatted to deliver high quality learning experiences that meet the goals and fulfill the mission of Blues In The Schools, Inc. Based on this premise, this program was developed to suit the needs of students in a variety of settings from organizations to schools. Many areas of culture and art are explored in a hands on setting where students actively participate in the creation of music and composition of songs that represent them. The purpose of the program is to introduce students to the Musical Art form that originated in Africa and was brought to the new world via slavery. The music has since undergone many changes but still maintains the essence of deep expression that the tradition it is based on instills. The programs goals include providing a forum where students can identify the cultural, geographical and historical origins and evolution of Blues music and the people who composed and played it while gaining an understanding of it's significance in the world of modern music and popular culture. How Does CBS Accomplish All This? We work to raise funds predominantly through our blues festivals but also through membership, donations and grants. We collect annual dues from members and receive donations from citizens who share our conviction to keep the blues alive. We have held fund raising concerts and events each year to assist in fund raising and since 2010 we have run an annual blues festival as our primary fund raiser. The funds that are raised and collected each year are used to host Spring and Fall programs in area schools. 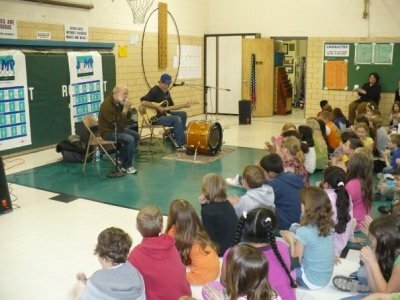 In March 2017 we embarked on a new school blues music endeavor with the Rockford Head Start Program. The 4 year olds got to participate in a shortened program with an introduction, 3 songs and a summary. They got to play along with the first two songs and dance to the third. "Little Red Rooster" offered the kids the opportunity to bark like dogs and howl like hounds as they kept the beat with tambourines and other percussion items. "Barnyard Boogie" let them make cow, bull, pig, hen and chicks sounds will also learning about and doing some call and response as they kept the beat. In "The Blues Had A Baby and They Called It Rock And Roll" they gave up the instruments and got up to learn a dance and sing along. Dan Phelps was tasked to help kick this off and after 25 programs we all knew we had a winner. Steve Jones developed the program and scripted it out along with creating song sheets with You Tube Links and coloring sheets for each song. Bob Haendler and Steve participated in the programs with Bob providing the actual animal sounds via Bluetooth so the kids could compare their sounds to the actual ones.​​ We visited Rockford Day Nursery, Orton Keyes, Hand-n-Hand, Fairgrounds, and Dennis (also RPS-205) Head Start Facilities. On top of the 25 programs we also did 4 more at Fairgrounds Early Childhood Facility for RSP 205. All in all 1180 kids got to participate. In 2018 Wheatbread Johnson took the helm for the programs as Dan took a day job. Wheatbread got the opportunity to do 57 programs as we expanded into the younger kids at the facilities and added Trinity Lutheran and the YMCA Headstart Facilities and worked with 1,510 kids. We also did a kick off program with the Head Start Faculty to show everyone what sort of impact we could have. Ron Holm performed and Steve Jones gave a presentation with a PowerPoint. For 2018 are trying to visit all the Headstart Facilities and all the RPS 205 pre-school facilities. This has become a wonderful addition to our BITS efforts! ​So far for 2018-2019, we have programs scheduled for all the Head Start Facilities and all the RPS-205 Early Childhood Facilities except for one. We will accomplish 63 Head Start and pre-school programs by years end, and have also added two programs with the Rockford Public Library and four with the Burpee Museum in June and July 2019. We also used this program format at Thurgood Marshall ES in Rockford, Rockton Grade School, and Ledgewood ES in Roscoe along with our Blues Fest for 31 other program presentations. Shown to the right is a photo from East HS. If you click on the button above the photo you can listen to the program recorded at Just Goods Listening Room. The program was written by Mark Dvorak and it is performed by he and local Rockford actor and educator David Causey. 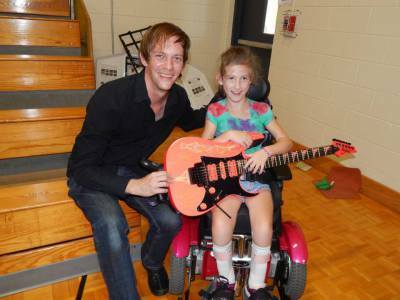 We are proud to help get this program in front of local students!